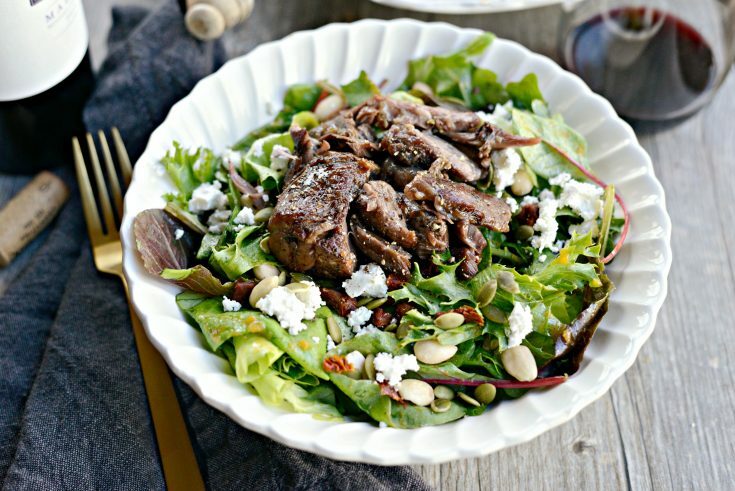 It’sThis wine braised lamb salad is deliciously rustic and hearty. Lamb shanks cooked low and slow in wine, garlic, vegetables and herbs until it’s falling off the bone. 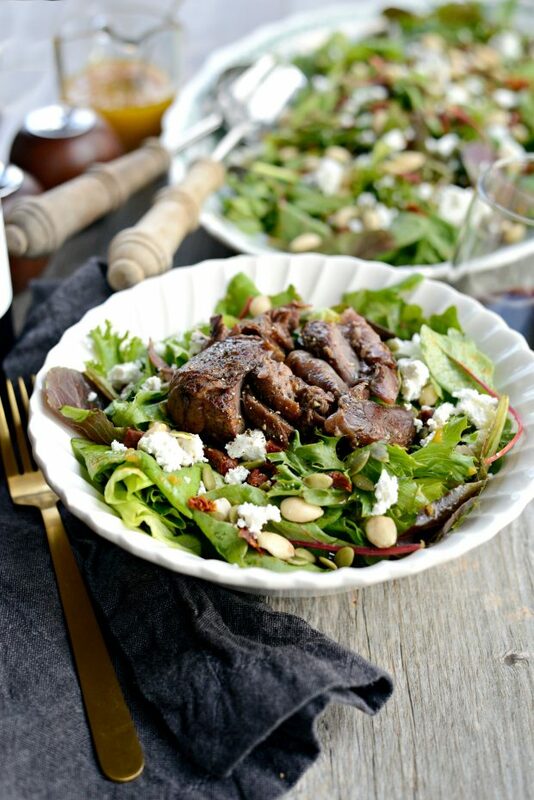 Then the tender lamb tops a mixture of lettuces with goat cheese, sundried tomatoes and almonds with a pumpkin vinaigrette. Last fall I had the most amazing salad of my life. Last week, I had just gotten back from doing a ton of traveling, so I took my daughters to one of our favorite places for lunch. It’s a quant little restaurant in a nearby town. When the waitress read the specials all I heard was braised lamb salad, goat cheese and an pumpkin vinaigrette. Instantly I knew exactly what I was going to order. 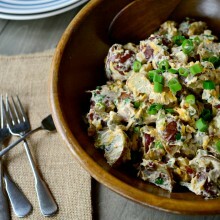 For weeks after I dreamed about that salad, I couldn’t get it out of my mind. So I did what any normal person would do and recreated it at home. 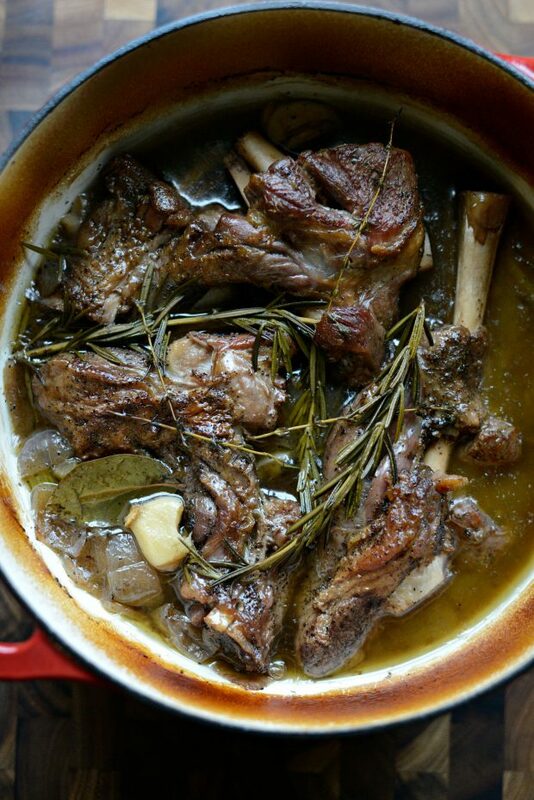 With that said, here are the delicious details; lamb shanks are cooked low and slow in wine, herbs, vegetables and broth until it is falling of the bone. 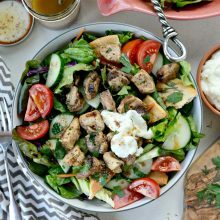 That gets topped, along with crumbled goat cheese, almonds, pepitas and sundried tomatoes on to lettuces that have been tossed in a pumpkin vinaigrette. I had to start this pretty early since it cooks for so long, so I didn’t take any step-by steps. But basically you season the lamb shanks with salt and pepper and sear them in a hot Dutch oven until crusty and golden. Then add in lots of smashed garlic, vegetables and herbs. Deglaze with wine, add the lamb back in with broth and bring to a boil. Then you’ll slide the whole (covered) pot into your awaiting 325° oven for 2-1/2 hours or until it’s so tender it’s falling off the bone. 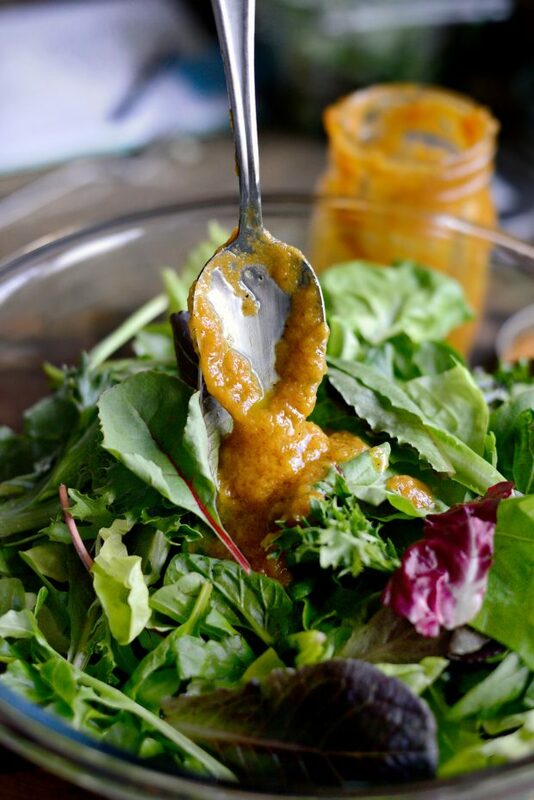 Meanwhile I made the vinaigrette, I just added all the ingredients: 1 small clove garlic (grated) and a teaspoon grated shallot, 1 teaspoon Dijon mustard, 1 teaspoon pure maple syrup, 1/4 cup roasted pumpkin puree, 2 to 3 tablespoons champagne vinegar and olive oil. Season with salt and pepper to taste and shake to combine. You can taste and adjust to your preference. After 2 to 2-1/2 hours the lamb is done and smelling all sorts of amazing! My mouth is literally watering as I type this. So darn good! Transfer the fully cooked lamb to a cutting board and cover with foil. 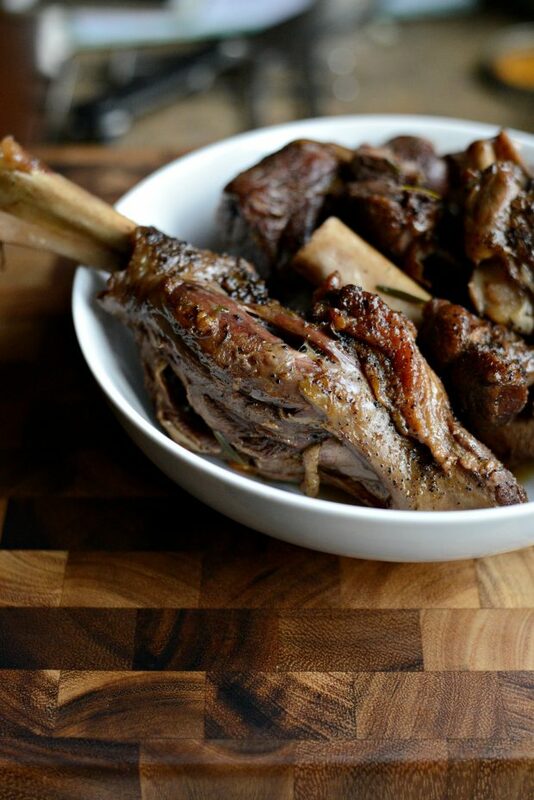 Allow to rest for a few before pulling the lamb off of the bone in large bite-size pieces. 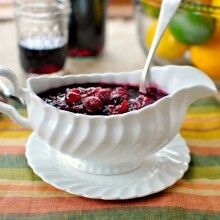 Next, place a cheesecloth-lined mesh strainer into a large liquid measuring cup or bowl. Then pour the remaining liquids through. You want to catch the broth-y liquids. I discard the vegetables but I’ll save (freeze) the lamb stock to use in soups or stews in the future. Right before serving place the leafy greens into a bowl and add some of the pumpkin vinaigrette. For blog purposes, I piled the dressed greens onto a platter and topped with all the fixings. But normally I’d do this on individual dinner plates. At first you’d think the funky lamb with the goat cheese would be too much funk. So not true! 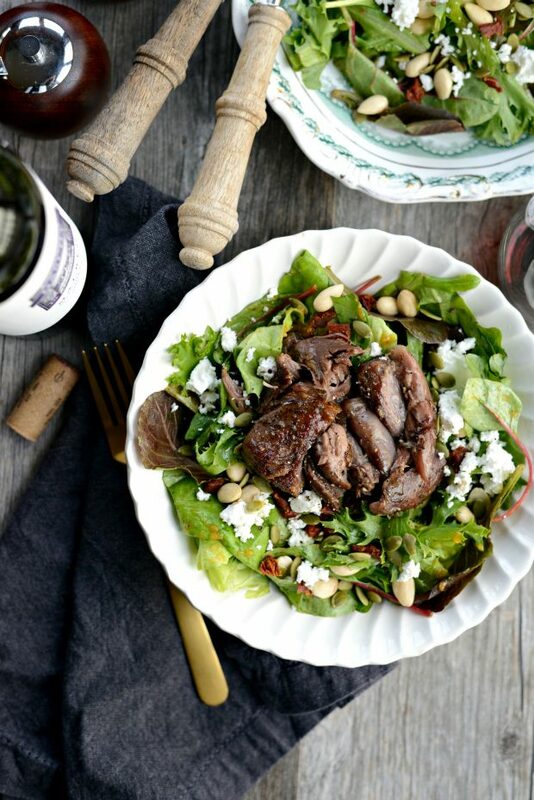 All the flavors and textures work so perfectly together and I love the warm lamb on the cool, crisp lettuces. Oh and I’ll let you in on a little secret… I also drizzle a little of the juice that collects in the dish (while they’re resting) and spoon it over top. It’s all just too good! Enjoy! 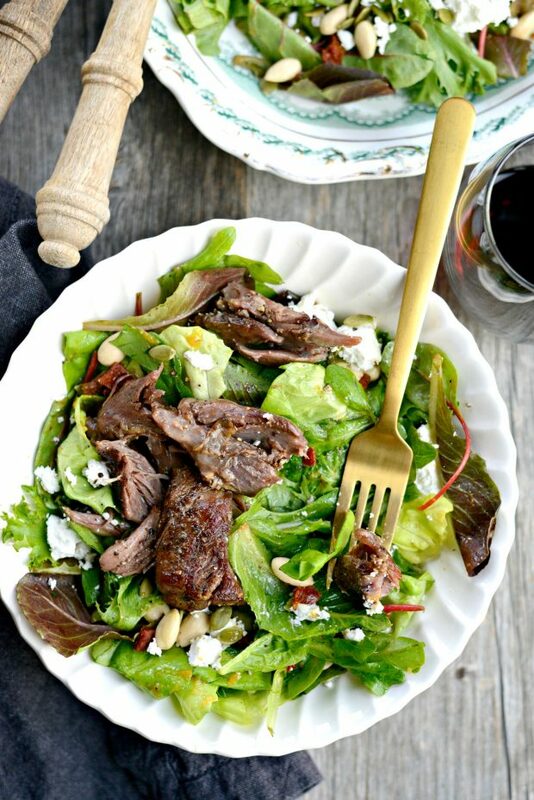 And if you give this Wine Braised Lamb Salad recipe a try, let me know! Snap a photo and tag me on twitter or instagram! This wine braised lamb salad is rustic and hearty. 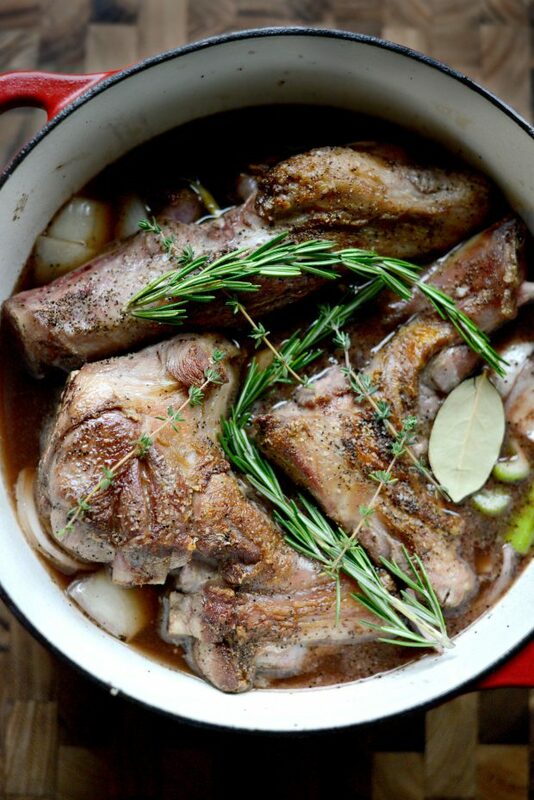 Lamb shanks are cooked low and slow in wine, garlic and herbs until falling off the bone. 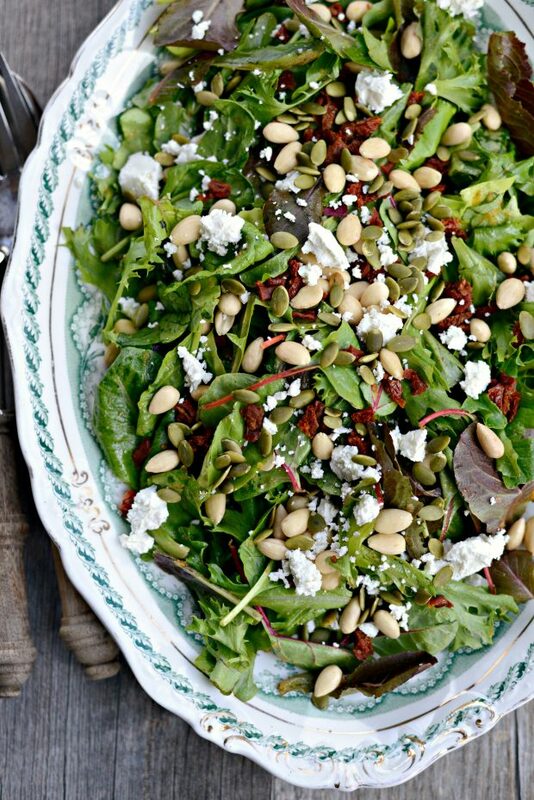 Then it tops a mixture of lettuces, goat cheese, sundried tomato and almonds with a pumpkin vinaigrette. Meanwhile, heat a large 6 quart Dutch oven over medium-high heat. Season lamb shanks generously with kosher salt and black pepper. When the pot is preheated, drizzle in a tablespoon or two of olive oil. Work in batches searing two lamb shanks at a time for 3 to 4 minutes a side or until they easily release from the pan and have a deep golden crust. Transfer seared lamb shanks to a clean plate and repeat with the second batch, adding a little more oil if needed. Once the lamb is seared, reduce heat to medium low and add in the smashed garlic. Cook for one minute before add in the onion, celery and carrots. Stir and cook an additional minute before pouring in the red wine, use a wooden spoon to scrape up any bits on the bottom of the pan. Next, nestle the lamb shanks onto the bed of vegetables and pour in enough beef stock to almost reach the op of the shanks, leaving the tops of them exposed. The lamb shanks should not be fully submerged. Add in the bay leaves, rosemary and thyme. Cover and increase the heat to high, bringing the liquids to a boil then sliding the covered pot into your preheated oven to braise for 2-1/2 hours or until falling off the bone. 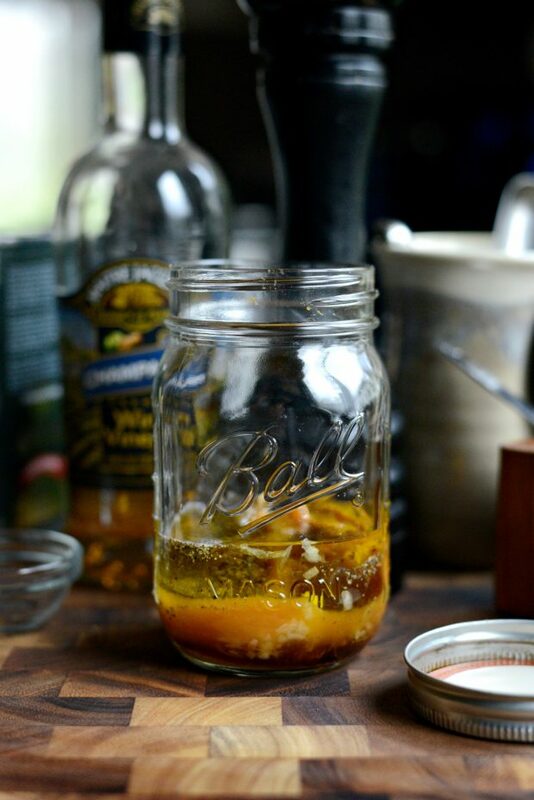 In the meantime make the vinaigrette by combing all ingredients into a jar and shaking until combined. Once the lamb has braised, use tongs to transfer them to a large bowl and cover with foil. Once cool enough to handle, pull the off lamb from the bone and cover with foil. 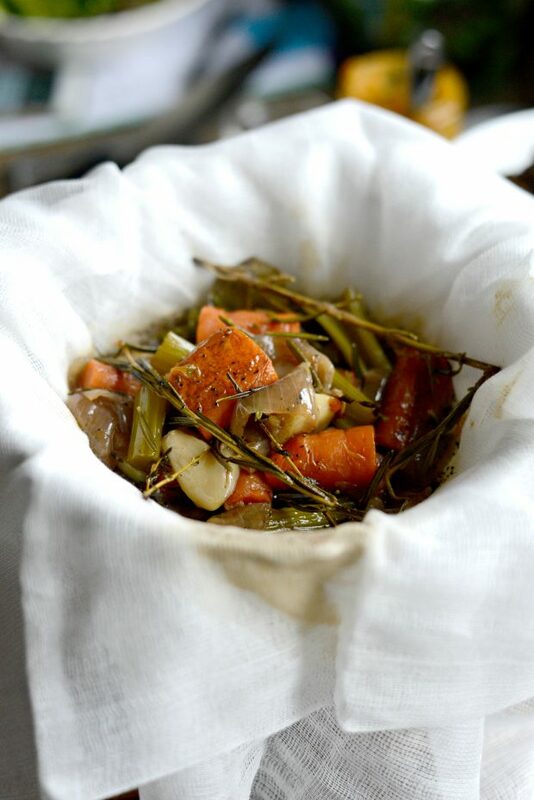 Strain the vegetables, herbs and liquids in the pot through a cheese cloth and into a large bowl. Refrigerate and then skim fat off the top once solidified. 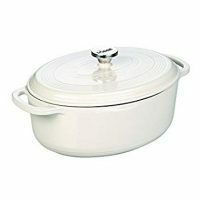 Transfer stock to a freezer safe container to use in soups, stews or for another purpose later. 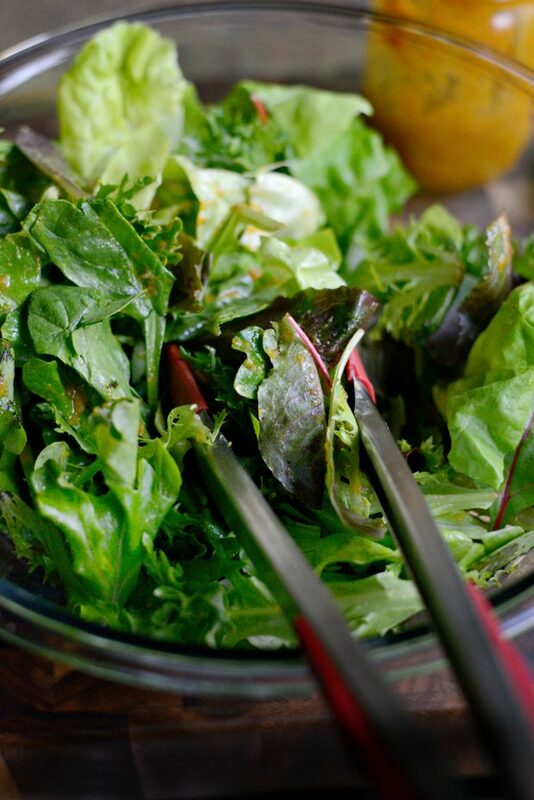 Before serving, toss lettuce leaves with some of the vinaigrette and divide among plates. 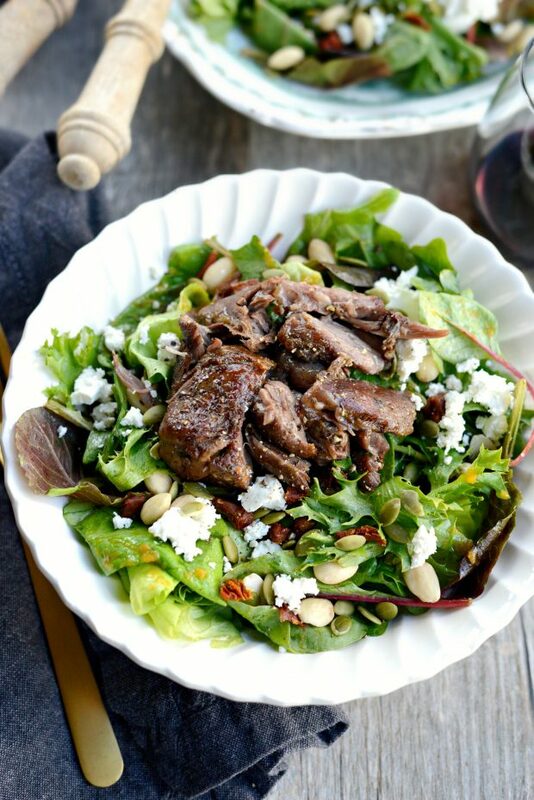 Top each with goat cheese, almonds, sundried tomatoes, pepitas and the braised lamb. Drizzle with any juices that accumulated in the bowl while the lamb was resting. Oooh! I’m good with anything that has been braised in wine!